Not to be confused with Profadol, Propanol, or Propranolol. Propofol, marketed as Diprivan among other names, is a short-acting medication that results in a decreased level of consciousness and lack of memory for events. Its uses include the starting and maintenance of general anesthesia, sedation for mechanically ventilated adults, and procedural sedation. It is also used for status epilepticus if other medications have not worked. It is given by injection into a vein. Maximum effect takes about two minutes to occur and it typically lasts five to ten minutes. Common side effects include an irregular heart rate, low blood pressure, burning sensation at the site of injection, and the stopping of breathing. Other serious side effects may include seizures, infections with improper use, addiction, and propofol infusion syndrome with long-term use. It appears to be safe for using during pregnancy but has not been well studied in this group. However, it is not recommended during cesarean section. Propofol is not a pain medication, so opioids such as morphine may also be used. Whether or not they are always needed is unclear. Propofol is believed to work at least partly via a receptor for GABA. Propofol was discovered in 1977 and approved for use in the United States in 1989. It is on the World Health Organization’s List of Essential Medicines, the most effective and safe medicines needed in a health system. It is available as a generic medication. The wholesale price in the developing world is between 0.61 and 8.50 USD per vial. It has been referred to as milk of amnesia (a play on milk of magnesia) because of the milk-like appearance of the intravenous preparation. Propofol is also used in veterinary medicine for anesthesia. Propofol is used for induction and maintenance (in some cases) of general anesthesia, having largely replaced sodium thiopental. It can also be administered as part of an anaesthesia maintenance technique called total intravenous anesthesia using either manually-programmed infusion pumps or computer-controlled infusion pumps in a process called target controlled infusion or TCI. Propofol is also used to sedate individuals who are receiving mechanical ventilation but are not undergoing surgery, such as patients in the intensive care unit. In critically ill patients, propofol has been found to be superior to lorazepam both in effectiveness and overall cost. Propofol may be more expensive in the short term but ultimately decreases ICU stay length, thus overall lowering costs. One of the reasons Propofol is thought to be more effective (although it has a longer half life than lorazepam) is because studies have found that benzodiazepines like midazolam and lorazepam tend to accumulate in critically ill patients, prolonging sedation. Propofol is very commonly used in the ICU as a sedation medication for intubated people. It can be run through a peripheral IV or central line. Propofol is commonly paired with fentanyl (for pain relief) in intubated and sedated people. Both are compatible in IV form. 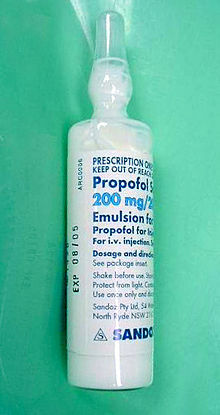 Propofol is also used for procedural sedation. Its use in these settings results in a faster recovery compared to midazolam. It can also be combined with opioids or benzodiazepines. Because of its fast induction and recovery time, propofol is also widely used for sedation of infants and children undergoing MRI. It is also often used in combination with ketamine as the two together have lower rates of side effects. The Missouri Supreme Court decided to allow the use of propofol to execute prisoners condemned to death. However, the first execution by administration of a lethal dose of propofol was halted on 11 October 2013 by governor Jay Nixon following threats from the European Union to limit the drug’s export if it were used for that purpose. The United Kingdom had already banned the export of medicines or veterinary medicines containing propofol to the United States. Recreational use of the drug via self-administration has been reported, but is relatively rare due to its potency and the level of monitoring required for safe use. Critically, a steep dose-response curve makes recreational use of propofol very dangerous, and deaths from self-administration continue to be reported. The short-term effects sought via recreational use include mild euphoria, hallucinations, and disinhibition. Recreational use of the drug has been described among medical staff, such as anesthetists who have access to the drug, and is reportedly more common among anesthetists on rotations with short rest periods (as rousing is to a well-rested state). Long-term use has been reported to result in addiction. Attention to the risks of off-label use of propofol increased in August 2009 due to the Los Angeles County coroner’s conclusion that music icon Michael Jackson died from a mixture of propofol and the benzodiazepine drugs lorazepam, midazolam and diazepam on June 25, 2009. According to a July 22, 2009 search warrant affidavit unsealed by the district court of Harris County, Texas, Jackson’s personal physician, Conrad Murray, administered 25 milligrams of propofol diluted with lidocaine shortly before Jackson’s death. Even so, as of 2016 propofol was not on a U.S Drug Enforcement Administration schedule. One of propofol’s most frequent side effects is pain on injection, especially in smaller veins. This pain arises from activation of the pain receptor, TRPA1, found on sensory nerves and can be mitigated by pretreatment with lidocaine. Less pain is experienced when infused at a slower rate in a large vein (antecubital fossa). Patients show great variability in their response to propofol, at times showing profound sedation with small doses. Additional side effects include low blood pressure related to vasodilation, transient apnea following induction doses, and cerebrovascular effects. Propofol has more pronounced hemodynamic effects relative to many intravenous anesthetic agents. Reports of blood pressure drops of 30% or more are thought to be at least partially due to inhibition of sympathetic nerve activity. This effect is related to dose and rate of propofol administration. It may also be potentiated by opioid analgesics. Propofol can also cause decreased systemic vascular resistance, myocardial blood flow, and oxygen consumption, possibly through direct vasodilation. There are also reports that it may cause green discolouration of the urine. Although propofol is heavily used in the adult ICU setting, the side effects associated with propofol seem to be of greater concern in children. In the 1990s, multiple reported deaths in children in ICUs associated with propofol sedation, prompted the FDA to issue a warning. Diminishing cerebral blood flow, cerebral metabolic oxygen consumption, and intracranial pressure are also characteristics of propofol administration. In addition, propofol may decrease intraocular pressure by as much as 50% in patients with normal intraocular pressure. Propofol is also reported to induce priapism in some individuals, and has been observed to suppress REM sleep stage and to worsen the poor sleep quality in some patients. As with any other general anesthetic agent, propofol should be administered only where appropriately trained staff and facilities for monitoring are available, as well as proper airway management, a supply of supplemental oxygen, artificial ventilation, and cardiovascular resuscitation. Because of its lipid base, some hospital facilities require the IV tubing (of continuous propofol infusions) to be changed after 12 hours. This is a preventative measure against microbial growth and infection. The respiratory effects of propofol are increased if given with other respiratory depressants, including benzodiazepines. Propofol has been proposed to have several mechanisms of action, both through potentiation of GABAA receptor activity and therefore acting as a GABAA receptor positive allosteric modulator, thereby slowing the channel-closing time, and at high doses, propofol may be able to activate GABAA receptors in the absence of GABA, behaving as a GABAA receptor agonist as well. Propofol analogs have been shown to also act as sodium channel blockers. Some research has also suggested that the endocannabinoid system may contribute significantly to propofol’s anesthetic action and to its unique properties. EEG research upon those undergoing general anesthesia with propofol finds that it causes a prominent reduction in the brain’s information integration capacity at gamma wave band frequencies. Researchers have identified the site where propofol binds to GABAA receptors in the brain, on the second transmembrane domain of the beta subunit of the GABAA receptor. Propofol is highly protein-bound in vivo and is metabolised by conjugation in the liver. The half-life of elimination of propofol has been estimated to be between 2 and 24 hours. However, its duration of clinical effect is much shorter, because propofol is rapidly distributed into peripheral tissues. When used for IV sedation, a single dose of propofol typically wears off within minutes. Propofol is versatile; the drug can be given for short or prolonged sedation, as well as for general anesthesia. Its use is not associated with nausea as is often seen with opioid medications. These characteristics of rapid onset and recovery along with its amnestic effects have led to its widespread use for sedation and anesthesia. John B. Glen, a British veterinarian and researcher at ICI (Imperial Chemical Industries ) spent 13 years developing propofol, an effort which led to the awarding to him of the prestigious 2018 Lasker award for clinical research. Propofol was originally developed as ICI 35868. Clinical trials followed in 1977, using a form solubilised in cremophor EL. However, due to anaphylactic reactions to cremophor, this formulation was withdrawn from the market and subsequently reformulated as an emulsion of a soya oil/propofol mixture in water. The emulsified formulation was relaunched in 1986 by ICI (now AstraZeneca) under the brand name Diprivan. The currently available preparation is 1% propofol, 10% soybean oil, and 1.2% purified egg phospholipid as an emulsifier, with 2.25% glycerol as a tonicity-adjusting agent, and sodium hydroxide to adjust the pH. Diprivan contains EDTA, a common chelation agent, that also acts alone (bacteriostatically against some bacteria) and synergistically with some other antimicrobial agents. Newer generic formulations contain sodium metabisulfite or benzyl alcohol as antimicrobial agents. Propofol emulsion is a highly opaque white fluid due to the scattering of light from the tiny (about 150-nm) oil droplets it contains. However fospropofol is a Schedule IV controlled substance with the DEA ACSCN of 2138 in the United States unlike propofol. By incorporation of an azobenzene unit, a photoswitchable version of propofol (AP2) was developed in 2012 that allows for optical control of GABAA receptors with light. In 2013, a propofol binding site on mammalian GABAA receptors has been identified by photolabeling using a Diazirine derivative. Additionally, it was shown that the hyaluronan polymer present in the synovia can be protected from free-radical synovia by propofol. ^ “Propofol”. Drugs.com. Retrieved 2 January 2019. ^ a b c d e f g h i j k l m n o “Propofol”. The American Society of Health-System Pharmacists. Archived from the original on 9 October 2016. Retrieved 21 January 2017. ^ a b Miner, JR; Burton, JH (August 2007). “Clinical practice advisory: Emergency department procedural sedation with propofol”. Annals of Emergency Medicine. 50 (2): 182–7. doi:10.1016/j.annemergmed.2006.12.017. PMID 17321006. ^ Wakai, A; Blackburn, C; McCabe, A; Reece, E; O’Connor, G; Glasheen, J; Staunton, P; Cronin, J; Sampson, C; McCoy, SC; O’Sullivan, R; Cummins, F (29 July 2015). “The use of propofol for procedural sedation in emergency departments”. The Cochrane Database of Systematic Reviews. 7: CD007399. doi:10.1002/14651858.CD007399.pub2. PMID 26222247. ^ Miller’s Anesthesia (8 ed.). Elsevier Health Sciences. 2014. p. 920. ISBN 9780323280112. ^ “Propofol”. International Drug Price Indicator Guide. Retrieved 23 January 2016. ^ Euliano TY, JS (2004). “A brief pharmacology related to anesthesia”. Essential anesthesia: from science to practice. Cambridge, UK: Cambridge University Press. p. 173. ISBN 978-0-521-53600-4. Retrieved 2 June 2009. ^ MD, David M. Novick (2017). A Gastroenterologist’s Guide to Gut Health: Everything You Need to Know About Colonoscopy, Digestive Diseases, and Healthy Eating. Rowman & Littlefield. p. 15. ISBN 9781442271999. ^ “Anesthesia Medications”. Veterinary Dentistry for the Small Animal Technician. Hoboken: Wiley. 2013. ISBN 9781118694800. ^ “PropoFlo (propofol) for Animal Use”. Drugs.com. Retrieved 13 February 2019. ^ a b c Cox, CE. ; Reed, SD. ; Govert, JA. ; Rodgers, JE. ; Campbell-Bright, S.; Kress, JP. ; Carson, SS. (March 2008). “Economic evaluation of propofol and lorazepam for critically ill patients undergoing mechanical ventilation”. Crit Care Med. 36 (3): 706–14. doi:10.1097/CCM.0B013E3181544248. PMC 2763279. PMID 18176312. ^ Barr, Juliana (1995). “Propofol”. International Anesthesiology Clinics. 33 (1): 131–154. doi:10.1097/00004311-199500000-00008. ISSN 0020-5907. ^ Isert, Peter R.; Lee, Doris; Naidoo, Daya; Carasso, Melanie L.; Kennedy, Ross A. (June 1996). “Compatibility of propofol, fentanyl, and vecuronium mixtures designed for potential use in anesthesia and patient transport”. Journal of Clinical Anesthesia. 8 (4): 329–336. doi:10.1016/0952-8180(96)00043-8. ^ McQuaid, KR. ; Laine, L. (May 2008). “A systematic review and meta-analysis of randomized, controlled trials of moderate sedation for routine endoscopic procedures”. Gastrointest Endosc. 67 (6): 910–23. doi:10.1016/j.gie.2007.12.046. PMID 18440381. ^ Machata, AM; Willschke, H; Kabon, B; Kettner, SC; Marhofer, P (August 2008). “Propofol-based sedation regimen for infants and children undergoing ambulatory magnetic resonance imaging”. British Journal of Anaesthesia. 101 (2): 239–43. doi:10.1093/bja/aen153. PMID 18534971. Archived from the original on 19 October 2014. ^ Yan, JW; McLeod, SL; Iansavitchene, A (20 August 2015). “Ketamine-Propofol Versus Propofol Alone for Procedural Sedation in the Emergency Department: A Systematic Review and Meta-analysis”. Academic Emergency Medicine. 22 (9): 1003–13. doi:10.1111/acem.12737. PMID 26292077. ^ Riezzo I, Centini F, Neri M, Rossi G, Spanoudaki E, Turillazzi E, Fineschi V (2009). “Brugada-like EKG pattern and myocardial effects in a chronic propofol abuser”. Clin Toxicol. 47 (4): 358–63. doi:10.1080/15563650902887842. PMID 19514884. ^ Belluck, Pam (6 August 2009). “With High-Profile Death, Focus on High-Risk Drug”. New York Times. Archived from the original on 11 November 2011. Retrieved 7 August 2009. ^ Iwersen-Bergmann S, Rösner P, Kühnau HC, Junge M, Schmoldt A (2001). “Death after excessive propofol abuse”. International Journal of Legal Medicine. 114 (4–5): 248–51. CiteSeerX 10.1.1.528.7395. doi:10.1007/s004149900129. PMID 11355404. ^ Kranioti EF, Mavroforou A, Mylonakis P, Michalodimitrakis M (22 March 2007). “Lethal self-administration of propofol (Diprivan): A case report and review of the literature”. Forensic Science International. 167 (1): 56–8. doi:10.1016/j.forsciint.2005.12.027. PMID 16431058. ^ a b Roussin A, Montastruc JL, Lapeyre-Mestre M (21 October 2007). “Pharmacological and clinical evidences on the potential for abuse and dependence of propofol: a review of the literature”. Fundamental and Clinical Pharmacology. 21 (5): 459–66. doi:10.1111/j.1472-8206.2007.00497.x. PMID 17868199. ^ C.F. Ward, 2008, Propofol: Dancing with a “White Rabbit” Archived 8 September 2017 at the Wayback Machine, CSA Bulletin, pp. 61–63, accessed 24 November 2014. ^ a b Charatan F (2009). “Concerns mount over recreational use of propofol among US healthcare professionals”. BMJ. 339: b3673. doi:10.1136/bmj.b3673. PMID 19737827. ^ Bonnet U, Harkener J, Scherbaum N (June 2008). “A case report of propofol dependence in a physician”. J Psychoactive Drugs. 40 (2): 215–7. doi:10.1080/02791072.2008.10400634. PMID 18720673. ^ Moore, Solomon (28 August 2009). “Jackson’s Death Ruled a Homicide”. New York Times. Archived from the original on 14 November 2013. ^ a b Surdin, Ashley (25 August 2009). “Coroner Attributes Michael Jackson’s Death to Propofol”. The Washington Post. Archived from the original on 9 November 2012. Retrieved 22 May 2010. ^ a b Itzkoff, Dave (24 August 2009). “Coroner’s Findings in Jackson Death Revealed”. The New York Times. Archived from the original on 11 June 2010. Retrieved 22 May 2010. ^ “Jackson’s Death: How Dangerous Is Propofol?”. Time. 25 August 2009. Archived from the original on 25 July 2010. Retrieved 22 May 2010. ^ “Michael Jackson search warrant”. Scribd. Archived from the original on 5 March 2016. Retrieved 12 August 2015. ^ DEA may limit drug eyed in Jackson case. Archived 6 April 2012 at the Wayback Machine Associated Press. 15 July 2009. ^ Matta, J. A.; Cornett, P. M.; Miyares, R. L.; Abe, K.; Sahibzada, N.; Ahern, G. P. (2008). “General anesthetics activate a nociceptive ion channel to enhance pain and inflammation”. Proceedings of the National Academy of Sciences. 105 (25): 8784–8789. doi:10.1073/pnas.0711038105. PMC 2438393. PMID 18574153. ^ “Propofol Drug Information, Professional”. m drugs.com. Archived from the original on 23 January 2007. Retrieved 2 January 2007. ^ a b Sebel, PS; Lowden, JD (1989). “Propofol: a new intravenous anesthetic”. Anesthesiology. 71 (2): 260–77. doi:10.1097/00000542-198908000-00015. PMID 2667401. ^ Robinson, B; Ebert, T; O’Brien, T; et al. (1997). “Mechanisms whereby propofol mediates peripheral vasodilation in humans (1997)”. Anesthesiology. 86: 64–72. doi:10.1097/00000542-199701000-00010. ^ “New awakening in anaesthesia—at a price”. Lancet. 8548 (8548): 1469–70. 1987. doi:10.1016/s0140-6736(87)92214-8. ^ Larijani, G; Gratz, I; Afshar, M; et al. (1989). “Clinical pharmacology of propofol: an intravenous anesthetic agent [published erratum appears in DICP 1990 Jan; 24: 102]”. DICP. 23 (10): 743–9. doi:10.1177/106002808902301001. ^ Jung SL, Hyun SJ, Byeong JP (2013). “Green discoloration of urine after propofol infusion”. Korean Journal of Anesthesiology. 65 (2): 177–9. doi:10.4097/kjae.2013.65.2.177. PMC 3766788. PMID 24024005. ^ Parke, T. J.; Stevens, J. E.; Rice, A. S.; Greenaway, C. L.; Bray, R. J.; Smith, P. J.; Waldmann, C. S.; Verghese, C. (12 September 1992). “Metabolic acidosis and fatal myocardial failure after propofol infusion in children: five case reports”. BMJ. 305 (6854): 613–616. doi:10.1136/bmj.305.6854.613. ISSN 0959-8138. PMC 1883365. ^ Langley, M; Heel, R (1988). “Propofol. A review of its pharmacodynamic and pharmacokinetic properties and use as an intravenous anaesthetic”. Drugs. 35 (4): 334–72. doi:10.2165/00003495-198835040-00002. PMID 3292208. ^ Bailey, J; Mora, C; Shafer, S (1996). “Pharmacokinetics of propofol in adult patients undergoing coronary revascularization”. Anesthesiology. 84 (6): 1288–97. doi:10.1097/00000542-199606000-00003. ^ Reilly, C; Nimmo, W (1987). “New intravenous anaesthetics and neuromuscular blocking drugs. A review of their properties and clinical use”. Drugs. 34: 115–9. doi:10.2165/00003495-198734010-00004. PMID 3308413. ^ Schramm, BM; Orser, BA (2002). “Dystonic reaction to propofol attenuated by benztropine (Cogentin)”. Anesth Analg. 94 (5): 1237–40. doi:10.1097/00000539-200205000-00034. ^ Vesta, Kimi; Shaunta’ Martina; Ellen Kozlowski (25 April 2009). “Propofol-Induced Priapism, a Case Confirmed with Rechallenge”. The Annals of Pharmacotherapy. 40 (5): 980–982. doi:10.1345/aph.1G555. PMID 16638914. ^ Fuentes, Ennio; Silvia Garcia; Manuel Garrido; Cristina Lorenzo; Jose Iglesias; Juan Sola (July 2009). “Successful treatment of propofol-induced priapism with distal glans to corporal cavernosal shunt”. Urology. 74 (1): 113–115. doi:10.1016/j.urology.2008.12.066. PMID 19371930. ^ Eumorfia Kondili; Christina Alexopoulou; Nectaria Xirouchaki; Dimitris Georgopoulos (2012). “Effects of propofol on sleep quality in mechanically ventilated critically ill patients: a physiological study”. Intensive Care Medicine. 38 (10): 1640–1646. doi:10.1007/s00134-012-2623-z. PMID 22752356. ^ “AstraZeneca – United States Home Page” (PDF). .astrazeneca-us.com. Archived from the original (PDF) on 4 October 2011. Retrieved 8 June 2013. ^ Vasile B, Rasulo F, Candiani A, Latronico N (2003). “The pathophysiology of propofol infusion syndrome: a simple name for a complex syndrome”. Intensive Care Medicine. 29 (9): 1417–25. doi:10.1007/s00134-003-1905-x. PMID 12904852. ^ Doheny, Kathleen; Louise Chang; Hector Vila Jr (24 August 2009). “Propofol Linked to Michael Jackson’s Death”. WebMD. Archived from the original on 28 August 2009. Retrieved 26 August 2009. ^ Trapani G, Altomare C, Liso G, Sanna E, Biggio G (February 2000). “Propofol in anesthesia. Mechanism of action, structure-activity relationships, and drug delivery”. Curr. Med. Chem. 7 (2): 249–71. doi:10.2174/0929867003375335. PMID 10637364. ^ Kotani, Y; Shimazawa, M; Yoshimura, S; Iwama, T; Hara, H (Summer 2008). “The experimental and clinical pharmacology of propofol, an anesthetic agent with neuroprotective properties”. CNS Neuroscience and Therapeutics. 14 (2): 95–106. doi:10.1111/j.1527-3458.2008.00043.x. PMID 18482023. ^ Vanlersberghe, C; Camu, F (2008). Propofol. Handbook of Experimental Pharmacology. 182. pp. 227–52. doi:10.1007/978-3-540-74806-9_11. ISBN 978-3-540-72813-9. PMID 18175094. ^ Trapani, G; Latrofa, A; Franco, M; Altomare, C; Sanna, E; Usala, M; Biggio, G; Liso, G (1998). “Propofol analogues. Synthesis, relationships between structure and affinity at GABAA receptor in rat brain, and differential electrophysiological profile at recombinant human GABAA receptors”. Journal of Medicinal Chemistry. 41 (11): 1846–54. doi:10.1021/jm970681h. PMID 9599235. ^ Krasowski MD, Jenkins A, Flood P, Kung AY, Hopfinger AJ, Harrison NL (April 2001). “General anesthetic potencies of a series of propofol analogs correlate with potency for potentiation of gamma-aminobutyric acid (GABA) current at the GABA(A) receptor but not with lipid solubility”. J. Pharmacol. Exp. Ther. 297 (1): 338–51. PMID 11259561. ^ Krasowski, MD; Hong, X; Hopfinger, AJ; Harrison, NL (2002). “4D-QSAR analysis of a set of propofol analogues: mapping binding sites for an anesthetic phenol on the GABA(A) receptor”. Journal of Medicinal Chemistry. 45 (15): 3210–21. doi:10.1021/jm010461a. PMC 2864546. PMID 12109905. ^ Haeseler G, Leuwer M (March 2003). “High-affinity block of voltage-operated rat IIA neuronal sodium channels by 2,6 di-tert-butylphenol, a propofol analogue”. Eur J Anaesthesiol. 20 (3): 220–4. doi:10.1017/s0265021503000371. PMID 12650493. ^ Haeseler, G; Karst, M; Foadi, N; Gudehus, S; Roeder, A; Hecker, H; Dengler, R; Leuwer, M (September 2008). “High-affinity blockade of voltage-operated skeletal muscle and neuronal sodium channels by halogenated propofol analogues”. British Journal of Pharmacology. 155 (2): 265–75. doi:10.1038/bjp.2008.255. PMC 2538694. PMID 18574460. ^ Fowler CJ (February 2004). “Possible involvement of the endocannabinoid system in the actions of three clinically used drugs”. Trends Pharmacol. Sci. 25 (2): 59–61. doi:10.1016/j.tips.2003.12.001. PMID 15106622. ^ Lee, U; Mashour, GA; Kim, S; Noh, GJ; Choi, BM (2009). “Propofol induction reduces the capacity for neural information integration: implications for the mechanism of consciousness and general anesthesia”. Conscious. Cogn. 18 (1): 56–64. doi:10.1016/j.concog.2008.10.005. PMID 19054696. ^ Favetta P, Degoute CS, Perdrix JP, Dufresne C, Boulieu R, Guitton J (2002). “Propofol metabolites in man following propofol induction and maintenance”. British Journal of Anaesthesia. 88 (5): 653–8. doi:10.1093/bja/88.5.653. PMID 12067002. ^ Veselis RA, Reinsel RA, Feshchenko VA, Wroński M (October 1997). “The comparative amnestic effects of midazolam, propofol, thiopental, and fentanyl at equisedative concentrations”. Anesthesiology. 87 (4): 749–64. doi:10.1097/00000542-199710000-00007. PMID 9357875. ^ “Drugs@FDA: FDA Approved Drug Products”. Accessdata.fda.gov. Archived from the original on 5 September 2014. Retrieved 8 June 2013. ^ Stein M, et al. (September 2012). “Azo-Propofols: Photochromic Potentiators of GABAA Receptors”. Angewandte Chemie International Edition. 51 (42): 15000–4. doi:10.1002/anie.201205475. PMC 3606271. PMID 22968919. ^ Kvam C, Granese D, Flaibani A, Pollesello P, Paoletti S (1993). “Hyaluronan can be protected from free-radical depolymerization by 2, 6-diisopropylphenol, a novel radical scavenger”. Biochem. Biophys. Res. Commun. 193 (3): 927–33. doi:10.1006/bbrc.1993.1714. PMID 8391811.